Emerald Isle is among N.C. beach communities that use a flag system to indicate surf conditions. 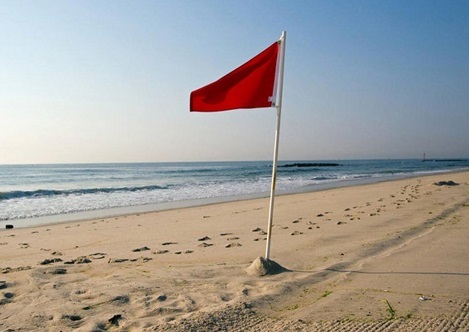 Beachgoers should learn what the flags mean in the community where they live or are visiting. Photo courtesy Town of Emerald Isle. The real risk of rip currents has hit home this summer on North Carolina beaches. “With five deaths in the state already in June, awareness is high. But we work with partners all year to keep the safety messages strong, especially as new visitors arrive each week in season,” notes Spencer Rogers, North Carolina’s Sea Grant’s coastal erosion specialist whose work has included a focus on rip current safety and research. As crowds of beachgoers continue to grow with the approach of Independence Day, a beach safety coalition — including communities, National Weather Service forecast offices and the National Park Service — is in full swing. Earlier this week, for example, the Hatteras Island Rescue Squad and the Town of Emerald Isle each offered the first in respective series of community education programs. On Hatteras, the audience included local residents and visitors from the entire island. “We asked what brought them. Some said they had heard news stories or noticed the rough surf,” explains Kermit Farrow Jr., who coordinates the series for the rescue squad that serves an area from Avon to Hatteras village. 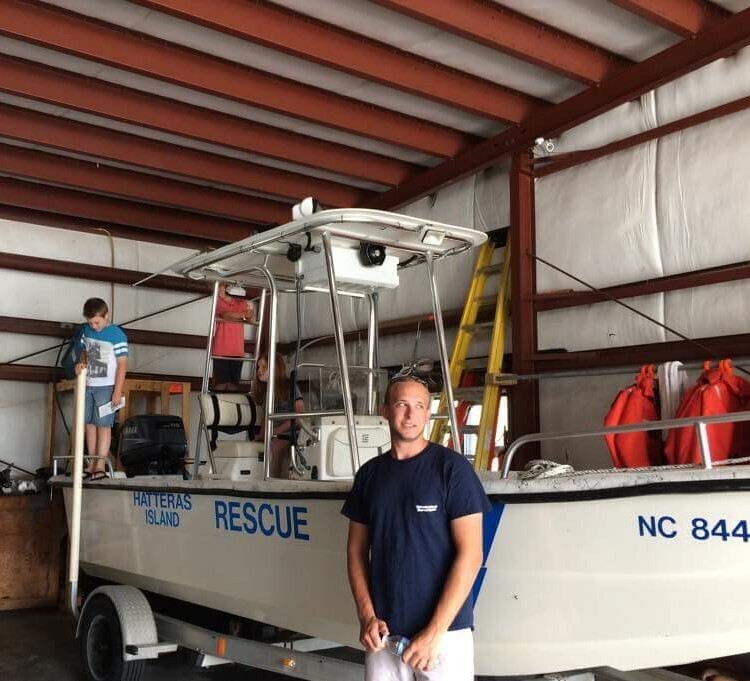 Youngsters can check out a rescue boat as part of weekly rip current safety sessions coordinated by Kermit Farrow Jr. of the Hatteras Island Rescue Squad. Photo courtesy Hatteras Island Rescue Squad. Geared for all ages, Hatteras sessions will continue every Monday at 9 a.m. through Labor Day at the Hatteras Island Rescue Squad on N.C. 12 in Buxton. The squad does not have lifeguards, but members trained in water rescues have roving patrols from 10 a.m. to 4 p.m. on weekdays, times they have the largest summer crowds. Farrow, a recent graduate of NC State University where he was a Sea Grant intern, expects the attendance at sessions to grow. Notices are posted in the squad’s daily beach updates on Facebook, and flyers are shared via rental companies, at park service campgrounds and by other partners. Those attending the Hatteras Island and Emerald Isle sessions are offered brochures developed through a national partnership that includes the National Oceanic and Atmospheric Administration and the U.S. Lifesaving Association. David Glenn of the NWS’s Newport/Morehead City Forecast Office was pleased with the large crowd that joined the Emerald Isle Police Department for its program. Additional sessions will be held this Saturday, June 24, at 9 a.m.; and Wednesday, June 28, at 6 p.m.
“While the spotlight is on rips right now, this is also a good time to remind folks that rip currents do occur on low-risk days and can be deadly then as well,” Glenn adds. The safety focus continues through the season up and down the North Carolina coast. Wrightsville Beach hosted an information session with the National Weather Service’s Wilmington office during Rip Current Awareness Week in May. The town’s popular junior lifeguard training includes rip currents, explains Dave Baker, director of Wrightsville Beach Ocean Rescue, one of eight in the state certified by USLA. 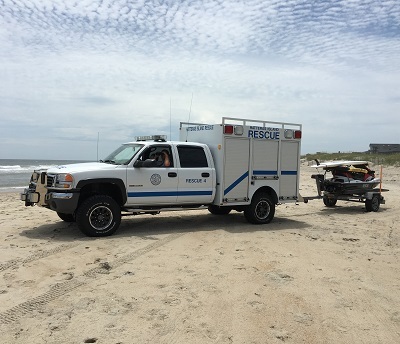 The Hatteras Island Rescue Squad does not have lifeguards but has beach patrols between Avon and Hatteras on summer weekdays. Photo courtesy Hatteras Island Rescue Squad. “We were continuing to be proactive when it comes to rip currents — educating the public, directing them to the NWS website for conditions and making rescues when all else fails — so everyone goes home at the end of the day,” Baker says. The daily forecasts are issued by all three NWS offices that cover N.C. beaches — the Wakefield, Virginia office that includes Currituck County; the Newport/Morehead City office that covers counties from Dare to Onslow; and the Wilmington office that covers beaches in Pender, New Hanover and Brunswick counties in North Carolina and into the Myrtle Beach area of South Carolina. The daily updates are regularly shared in weather reports on news outlets from the coast to the Triad, as well as widely in social media, especially when the risks are high. Many vacation rental companies and visitor centers also provide rip current brochures and refrigerator magnets available from Sea Grant. Rich Bandy, who leads the NWS office in Newport, appreciates the combination of efforts to educate beachgoers. “It is imperative to understand the risks of rip currents and what to do when caught in one. Always try to swim near a lifeguard, heed their advice, and avoid swimming when danger flags or beach closures are posted,” he says. “By ignoring the warnings, you not only are putting your life at risk, but risking others who would try to rescue you. The attempted rescuer is often the one who ends up perishing in the rip current,” he adds. Visitors to the Cape Hatteras National Seashore and N.C. State Parks with ocean beaches are seeing new bilingual rip currents safety signs at access points. Stacey Sigler notes that the National Park Service manages 67 miles of seashore from Whalebone Junction to Ocracoke, thus sparking an order of about 180 signs from Sea Grant. The signs are another piece of the long-term partnership for USLA and NOAA, which includes NWS and the National Sea Grant program. “We have replaced some older signs already that had faded,” explains Sigler, who leads the seashore’s safety efforts. “And we are conducting an inventory of our public beach access points, as well as private access points leading to the seashore,” she adds. Another 14 signs also were added at beaches run by the state parks at Fort Fisher, Fort Macon and Hammocks Beach with its Bear Island. The Nags Head Fire Department’s new budget also includes funding to add bilingual signs from Sea Grant. Safety collaborations get a push each winter at annual meetings held along the coast to bring together ocean rescue leaders, the weather service forecasters, Sea Grant and other partners. “It is an amazing group. All have wonderful things to contribute,” Sigler says, noting the varied efforts reinforce a similar theme. 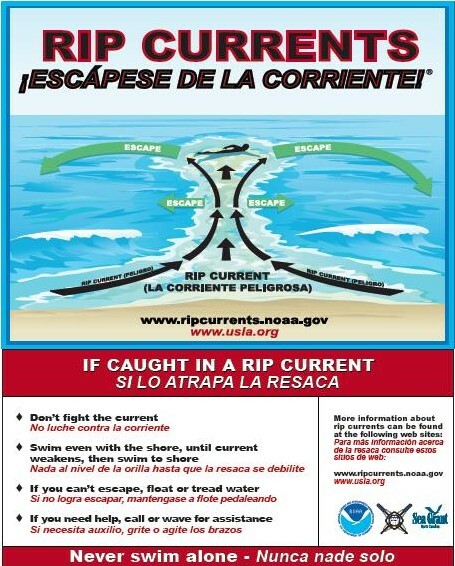 Look for a bilingual rip current safety poster in the summer issue of Coastwatch magazine. For North Carolina Sea Grant’s rip current efforts, go to ncseagrant.ncsu.edu/ripcurrents. There you will learn about rip current research, and find links to order signs or magnets and to request brochures. For national rip current safety information, go to ripcurrents.noaa.gov, and check this Media Advisory.